Hope everyone enjoys the mod and thanks to all those who downloaded and endorsed it. Lemme know if there is any issues with the file. I know some folks in the comments are thinking this is just a silly thing, but it's quite realistic for a norse/viking inspired mod. It's likely that psychedelics were used by berserkers, by magic users (seidr workers), and recreational use too. Can't wait to play around with this, even just from a RP and non-combat perspective. Humans have been using and abusing drugs for thousands of years and we always will. Its in our nature so yes I agree with you on that. The Norse/Vikings discovered stuff and used it and the rest is history. I hope you find the mod enjoyable. I tried a few of the mushrooms and wow, some of the visuals can get pretty intense. Good luck. The idea that 'vikings' or indeed 'berserkers' would take mushrooms is highly overstated, if not entirely disproved. It's a modern re-imagining for political/social reasons as per usual. 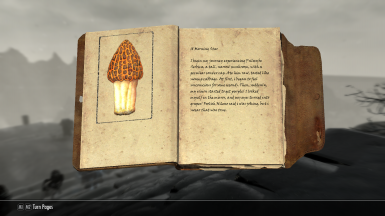 I'm thinking About replacing the meshes of several of these for myself as I'm somewhat of a mushroom expert irl. And the meshes not adding up to what the species look like in real life has begun bugging me quite a bit. I think I will use the wispcap model for P. semilanceata for starts and work my way through the others. it doesn't help that I'm currently using skyrim 3d trees as my floral overhaul and it has a few things that need tweaking. Sounds like a great idea. When your done with the meshes and stuff and if you like how they turned out, I would be more than happy to see them. 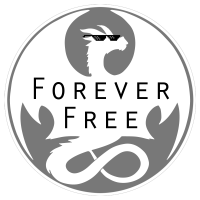 Then I can always add your meshes to the optional files section and offer them to players and credit you for it. Unless you don't want to. Its all good either way. If you decide to then send me a PM with the link to the file and pics if you take any screenshots with the new meshes. so your mod will have meshes that match the species. their real life counter parts was bugging me so I'm systematically replacing them with better versions, I will probably even retexture them all to fit my vision better so they stand out at shops and I'm even tempted to down the line add some in the world as harvestable specimens with harvestable world meshes too. Hey I am all for it. If you wanna get the ball rolling I can message them and let them know I am good with it too. It sounds like a great idea, especially being able to harvest them out in the world. I like the textures by Hogan anyways. Moved my comment to a reply. Cute. Not at all like the fungi or the effects (think roots of Mixtec, Aztec, and Maya art)... but still a hoot. Good, imaginative work. 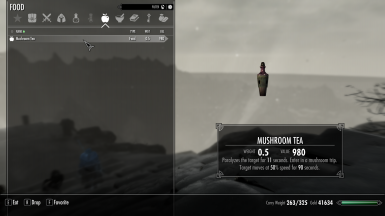 So does this mod add new mushrooms to the game? Gonna try it anyway but I don't want to lose/replace anything. Yes, in the description under the YouTube video, I have included the mushroom list that this mod adds along with the form ID's for them. You can find them as loot in chests but they are an uncommon find and the same thing with Vendors having them too. Its the way Dogola designed it the CK. 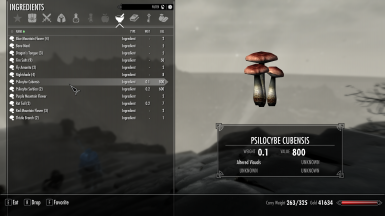 However you can't pick them like the other types of mushrooms in the game. Hey that sounds like a pretty cool idea but that would take a whole other level of scripting and such to make that happen which I don't have but maybe someone will read this that has scripting knowledge and make it happen. 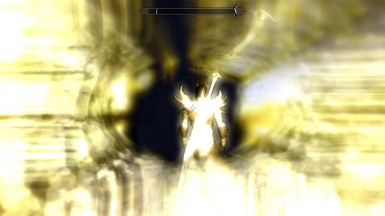 It would take this mod to a whole new level if it happened. 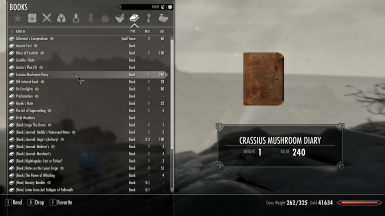 A dedicated shroom farm to grow these. That would be awesome in my opinion. hahaha fair shout though I'm rocking the rick and morty main menu myself lol i need a better combat music me thinks. 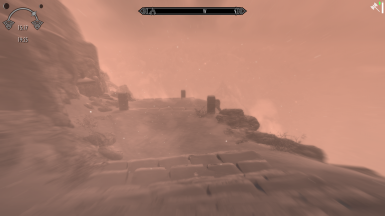 This here mod would work really well with elemental dragons me thinks especially that one that makes the sky go all funky. Cue's up Jefferson Airplane's "White Rabbit", Iron Butterfly's In A Gadda Da Vida, and crown it all with Santana's Soul Sacrifice.Now that would be awesome, consume the 'shroom and In A Gadda Da Vida plays. For you youngins those are probably three of the great psychadelic songs of all time. Y'know what throw Pink Floyd's Astronomy Domine on that list. Nice! My man. You picked the best songs for this. Too bad you can't have a "radio station" like you can in Fallout 4. When you pop one of these, you can throw on the music and enjoy the ride. Update: The Fly Amanita optional .esp works great. Just tested it in my game and all is good. 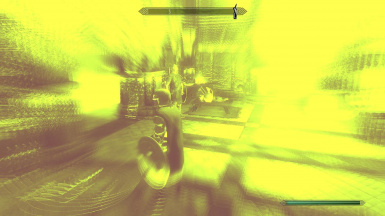 Plus it gives a really cool red-screen effect when used. I will add a pic of it to the image gallery. Download and enjoy.